At CJSM we are already anticipating the start of 2014: the January 2014 issue is still awaiting publication, but we are already releasing some of this coming year’s studies in our “Published ahead of print” collection. One I wanted to talk about today, if only because the subject sport is an entirely new one to me: Ringette-related injuries in young female players. Ringette. As a middle-aged guy, I know I still have a lot to learn. That said, I am delighted when I have a day where I acquire some new fact or concept I literally have never encountered in my over 18000 days on the planet. Ringette. I had never heard of this sport until I read this epidemiologic study. Nearly everything I now know about the sport comes courtesy of the authors Glenn Keays, Isabelle Gagnon, and Debbie Friedman. Thanks to you all! A team sport played on ice rinks, ringette is similar to ice hockey with these notable exceptions: 1) 6 skaters comprise a team; 2) the skaters advance a doughnut shaped ring, rather than a puck, with a stick that has no blade; 3) the rules governing the sport encourage the development of team play; for instance, a player that might be lionized in hockey for being able to single-handedly advance the puck the length of the rink and score is, in ringette, penalized instead. Like competitive women’s ice hockey, ringette is a non-collision sport, with all contact between players officially prohibited. Players are equipped with safety devices such as helmets and visors. The sport has been around for 50 years, originating in Canada. It is expanding internationally, with associations in the USA, Finland, Sweden and beyond. A new sport is born? In some ways, I am reminded of netball, the modified version of basketball, principally played by women, I have seen enjoyed in New Zealand during some time I have spent there. But I’m sure afficionados of both netball and ringette don’t want to be compared with something else. I would suspect they want to be enjoyed on their own terms. And such sports need to be understood from a sports medicine point of view on their own terms, as well. The authors of the new CJSM study note that they could find only two other studies of ringette in the medical literature prior to their own. Though it may be tempting, it would not be ideal to extrapolate from what we know about injury patterns in female ice hockey. We need to better understand ringette injury patterns. And so, the authors looked at the injuries sustained by Canadian girls, age 10 to 17 years, playing organized ringette and presenting to Emergency Departments between 2004 and 2010. They employed the Canadian Hospitals Injury Reporting and Prevention Program (CHIRPP) database. The CHIRPP database has been used widely in the injury prevention literature; for instance, CJSM has published a study looking into the efficacy of bicycle helmets at preventing pediatric head injuries, wherein the authors used data from the CHIRPP database. The authors report that the majority of injuries (73.8%) were ‘minor,’ and that the head was the body part most frequently injured (31.6%). Injury patterns varied with age. The youngest players (“Atome”, aged 10 – 11 years) suffered more upper extremity injuries than any of the other three, older age groups (Benjamine, Junior, and Cadette). Concussions and suspected concussions comprise a fairly high percentage of the injuries seen, ranging from 22.3% to 32.4% depending on age group. Finally, though prohibited, contact, whether intentional or accidental, is associated with injury in this sport. Overall, 36.4% of the injuries involved no contact with a player (e.g. ice/board), while 29.9% involved incidental contact with a player and one third of all injuries, 33.7%, involved intentional contact with another player. This finding especially stood out for me, most especially since this is a sport that nominally prohibits contact. The authors state in their discussion that the proportion of intentional contact injuries in ringette is comparable to that seen in female ice hockey, where contact is also prohibited. I would like to learn more about this sport. For instance, I am left wondering if in organized ringette there is a penalty box, as there is in ice hockey, for people who are guilty of intentional contact. What might we do to reduce the percentage of intentional contact injuries, and lower the overall injury rate in this sport? Are the unintentional contact injuries largely due to people still learning to control their bodies on skates? As for the non contact upper extremity injuries, I wonder how many are FOOSH mechanisms? From the study, I gather that 22.8% of the non contact injuries result in fractures. I wonder what percentage of these might be scaphoid? As ever, good research like this prompts further questions, sparks further inquiry. I’m looking forward to future studies on this sport. And I’m hoping to catch it live some day so I can see the action first-hand! Ringette: who knew? I do now! 6 Responses to Ringette: Who Knew? Yes, ringette does indeed have a penalty box, and many of the penalties would be familiar to those who follow hockey (tripping, slashing, hooking, etc). There is a penalty for body contact, and a compulsory 4-minute penalty when the initial point of contact is from behind or to the head. A high-sticking penalty results when the stick is carried above shoulder height in proximity to another on-ice participant, whether or not contact occurs. Most body contact or boarding penalties and many of the injuries result from the high speed nature of the sport, particularly at the elite level. The rules of the game promote a faster tempo of play than in women’s hockey (at the comparable age and skill level). For example, there are no offsides, and skating with the ring is faster that skating while stickhandling a puck. John thanks for that insight, and the link. Really appreciate it. Thanks for the article on ringette! Try watching it someday, it’s the fastest game on ice! There are 5 skaters on the ice. Two forwards, a centre and two defence. Plus the goalie. Jim, here is a link to the World Ringette Championship starting this month. Thanks for the article on ringette – I agree with the rest, definitely try to make it out to a game if you get a chance. You’ll find much has changed in ringette now from your research – for example, girls (and boys!) as young as 4 and 5 have the opportunity to learn to play ringette. In these levels, as well as the house league levels, many incidental contact injuries are as a result of the still developing ability to control the body while on skates. In older and more elite levels, incidental contact is more likely to be a result of situations where two players are going fast into a play and contact occurs, especially if the play is at the boards. Yes, there are penalty boxes. As John below me pointed out, we have penalties much the same as hockey does – tripping, boarding, cross-checking, and hooking are all examples of penalties, and body contact is also a penalty because it is prohibited. There is an emphasis on eliminating contact to the head and from behind – to enforce it, we have a 4-minute major penalty (fully served, much like a major penalty in hockey) that is assessed in such cases. Intentional contact with intent to injure carries an automatic ejection. Most injuries that I’ve seen over my time in the sport come from either incidental contact or offenses that are penalized – a body check, for example. 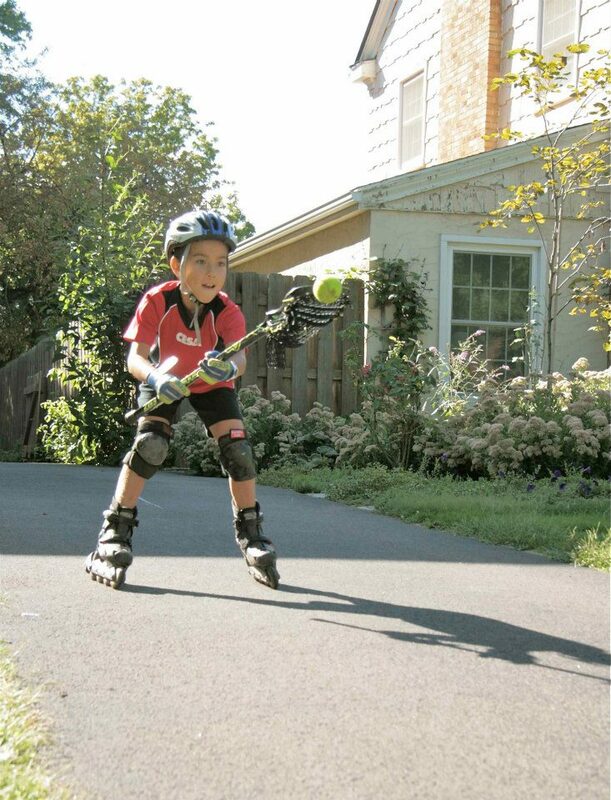 Though contact is prohibited, the reality of the sport is that it happens, which is why we wear protective equipment like that of a hockey player, as well as helmets and full face masks. Many associations have begun to enforce the wearing of mouthguards as well. Enjoy your journey into our world in ringette – maybe we’ll see you around the rink one day! Thanks for that, and I look forward to seeing my first game!